Over this last summer, the Real Life Real Music Foundation was given the opportunity to conduct our first “Songwriter Experience” workshop for student residents at The Settlement Home in Austin, and students adopted or fostered through DePelchin Children’s Center in Houston. We believe that the power of music has the ability to change lives for the better. You’ve probably experienced this phenomenon in your own life; whether its a song that brings you back to a certain time, helps you know that you’re not alone, or just brightens up your day. We hoped that fully experiencing the songwriting process would be inspire the students and leave a lasting impression on their confidence and attitude. 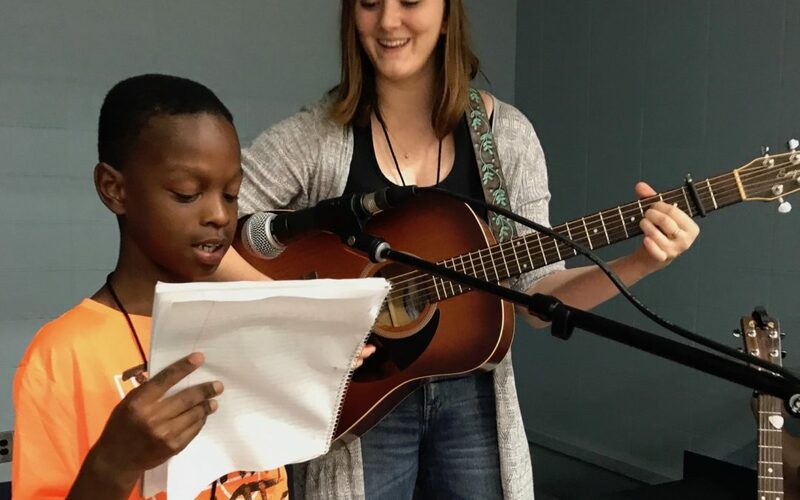 With this goal in mind, our team of experienced songwriting mentors to drove down to the cities of Houston and Austin to teach foster children how to write, record, and perform their own original songs. Over the two weeks of working in the cities we learned some things. First, our mentors needed to learn how to rap. Second, these students had a LOT of stories that they were eager to tell. We set out during the first two days of the camp to get those stories down on paper. We believe that the self expression that songwriting gives kids is the best therapy around. The students were able to turn their stories into songs within a safe and loving environment. By the end of the week, every young student that entered the program left with their own original work of art. On the last day of camp they performed their songs live for each facility’s administration. We hope that the student’s experience over this past summer changed their life for the better. We hope we inspired them to pursue their passions and refine their own talents. Let us know what you think on Facebook! Has music ever changed your life? Is there a particular song you feel you best relate to? We want to know!